Best stay out their way. 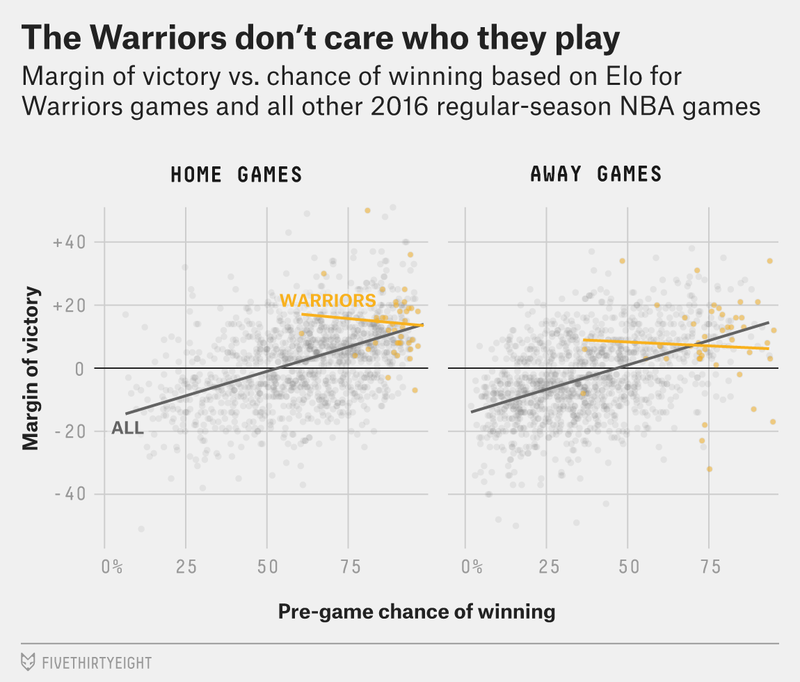 With a 2-0 series lead in the NBA Finals heading to Cleveland, the FiveThirtyEight NBA Elo model gives the Golden State Warriors an 89 percent chance of repeating as champions, which — admit it — feels low. 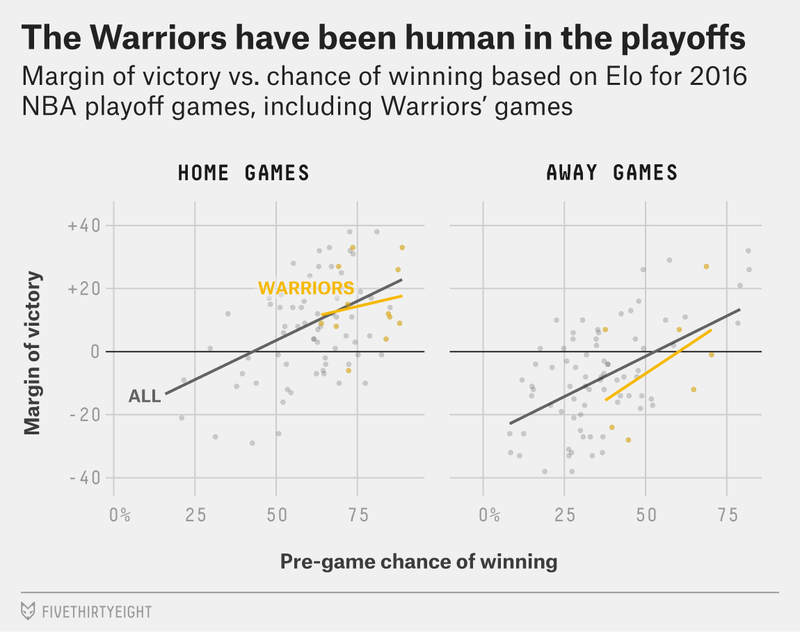 I’m personally on record as being more bullish about the Warriors’ chances than the models, mostly because the playoffs are typically super-deterministic, and the Warriors — as defending champs and the winningest team in history — seem super-determined. Moreover, they’re now 4-0 against the Cavaliers this season, winning by an average of 22 points per contest. Kevin Love will reportedly be out in Game 3 — though he was also out the last time Cavs put up much resistance against the champs, in last year’s finals. To take this series, the Warriors need only win two of their five remaining games — a feat they have accomplished in every five-game stretch they’ve played this season (they have only lost three of five once, against the Thunder in the Western Conference Finals). But there’s one other thing about the Warriors that has flown under the radar and may also speak well of their chances: their complete lack of regard for their opponent. To some extent, I think so. As we know, Stephen Curry is virtually immune to defense.2 He also gives the Warriors the ability to speed up when behind (transition buckets) or slow down when ahead (run offense then drop bombs under pressure), which may help normalize margins. And of course he sat quite a lot in blowouts, keeping the Warriors’ margins in check on either side. Or it’s possible that the Warriors really are winning machines and generally only lose when they are unfocused or out of sorts. All of which would be bad news for the Cavs, as it would suggest that the strength reflected in the models may not reflect the Warriors’ true strength. Here’s the good news for the Cavs: Three of the five remaining games are in Cleveland, and the Warriors have been significantly weaker on the road than at home. Their average margin was 7.4 points lower on the road (relative to expectation based on SRS difference) than at home –- good for the league’s sixth-largest such differential. That’s pretty remarkable for a team whose road win percentage was higher than the vaunted Spurs’ overall win percentage (the Road Warriors were the equivalent of a 68-win team). Of course, with such small samples, already shaky trends are even less meaningful. The two huge losses on the road against Oklahoma City are enough to drag down the Warriors’ playoff road results. The Warriors have lost four of seven road games in these playoffs, with two of those losses coming with Curry out of the line-up. Further, it’s not really clear whether Curry was back to 100 percent during the Warriors’ worst stretch of the season against the Thunder — or if he is now. The Cavs — who made the second-most 3-pointers during the regular season — also had a weakish relationship between opponent strength and performance. However, they were certainly closer to standard than Golden State was, particularly at home (including a 34-point loss to the Warriors in January). But they have yet to lose at home in these playoffs. Now, this may seem like a trivial thing, but it matters immensely for these teams’ prospects. The Cavaliers need their strength to matter, or they’re toast. The Warriors need to win two of five, with three on the road. With their regular season home/away splits — that is, against an average regular season opponent — their chances of doing this would be somewhere along the lines of 99.7 percent, around a 1-in-300 proposition for the Cavs. The model, on the other hand — which gives the Cavaliers’ strength full credit — assigns the Cavaliers a relatively high 11 percent chance of winning four of five. 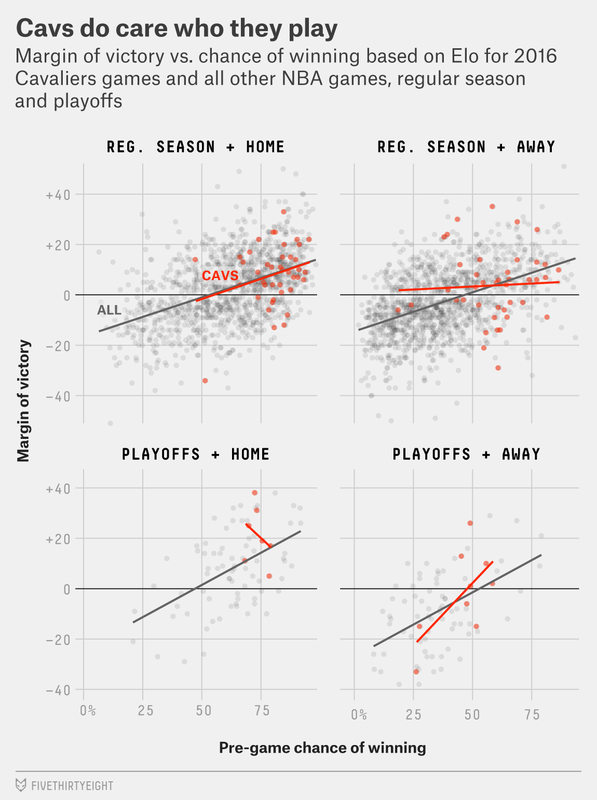 Either way, the Cavs’ chances don’t look great, but that’s a 30-fold difference. Note: you could argue that the disparity may exist in part because Elo ratings are less accurate toward the beginning of the season. This may be true on the margins, but I’ve replicated this using SRS (which relies on the entire season of data) and the results were similar (R-squared approaching 0). My pet theory is that when the Warriors face teams that frustrate their offense, they’re forced to make Curry take inadvisable shots, which is like their briar patch.